The Way Magazine | How Do Sons of God Walk? With Manifested Power! Home » Articles » Our Rights as God's Sons and Daughters » How Do Sons of God Walk? With Manifested Power! I never grow tired of searching the Scriptures to learn more about the Apostle Peter. Among the twelve apostles of Jesus Christ, Peter is unique in that so much about his life is recorded in the Gospels that we can get a good glimpse of his character and personality. Then, in the Book of Acts, we get to enjoy reading how, after being born again on the day of Pentecost, Peter walked with boldness as a son of God. How did he do this? By believing the Word of God he had been taught and by manifesting the power of holy spirit. His example can inspire us to take action today—to reach out with a heart of love and that same power in manifestation as God’s sons today. In Acts we can clearly see how Peter walked as a son of God—with power! While Jesus Christ was still on the earth, he told Peter and the other disciples that they would do the works that he had done and greater. In addition, Jesus Christ taught his apostles that they would be witnesses to all the world of all God had accomplished through His only begotten Son. But ye shall receive power, after that the Holy Ghost [holy spirit] is come upon you: and ye shall be witnesses unto me both in Jerusalem, and in all Judaea, and in Samaria, and unto the uttermost part of the earth. Along with the other apostles, Peter was born again on the day of Pentecost. From that very day he began to manifest power from on high by speaking in tongues (Acts 2:4). Believing what Jesus Christ had taught him about what he could do after receiving this power, Peter took bold action. But Peter, standing up with the eleven, lifted up his voice, and said unto them, Ye men of Judaea, and all ye that dwell at Jerusalem, be this known unto you, and hearken to my words. Peter immediately taught others how to receive this spiritual gift and manifest power from on high. He had the assurance from Jesus Christ that this same gift of holy spirit, which Jesus had called “the comforter,” would help him remember and do those things which God had called him to do (John 14:12,13,16). Right after he was born again, Peter spoke up with boldness to be a witness, just as Jesus Christ had told him he could. He began to teach others of the greatness of the new birth. Peter didn’t need to wait for more instruction. He acted on what he knew. Then Peter said unto them, Repent, and be baptized every one of you in the name of Jesus Christ for the remission of sins, and ye shall receive [into manifestation] the gift of [from] the Holy Ghost [God]. Peter had received the gift, and he operated the same manifestations of holy spirit that are available to us today so that we can walk powerfully for God. These manifestations are listed in I Corinthians. To another the working of miracles; to another prophecy; to another discerning of spirits; to another divers kinds of tongues; to another the interpretation of tongues. By studying other records in the Book of Acts where Peter manifested this power to bring God’s will to pass, we can see how we can walk with that same power as sons of God today. 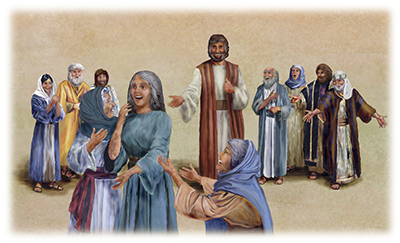 The first expanded record in Acts that shows Peter manifesting the power of the holy spirit to help an individual is the healing of the lame man at the Temple gate called Beautiful. In Acts 3 Peter used the name of Jesus Christ to command healing as he and John believed with this man. We don’t know how much of God’s Word the lame man was taught before Peter ministered healing, but we do know that Peter and John understood the power that was theirs to call upon by using the name of Jesus Christ. They would have been knowledgeable of the seventy disciples sent out by Jesus Christ, who returned to him with joy and reported, “Lord, even the devils are subject unto us through thy name” (Luke 10:17). “Through thy name” or “in thy name” (Luke 9:49) means by the authority of the person who is named. The name is used for everything which it represents, everything aroused in our memory by hearing or mentioning that particular name. When Peter used the name of Jesus Christ in ministering to the lame man, he knew that the power for healing was not backed by his own authority, but by all the authority and resources available in the name of Jesus Christ. Peter had confidence in his God-given authority to use the name of Jesus Christ and see things come to pass. That’s why he could say to the man, “Rise up and walk”—get up and do it! What believing boldness we see in Peter’s life…. This is an excerpt from the May/June 2007 issue of The Way Magazine.